Want to know more about Eleanor Courtown? Check out the trailer! 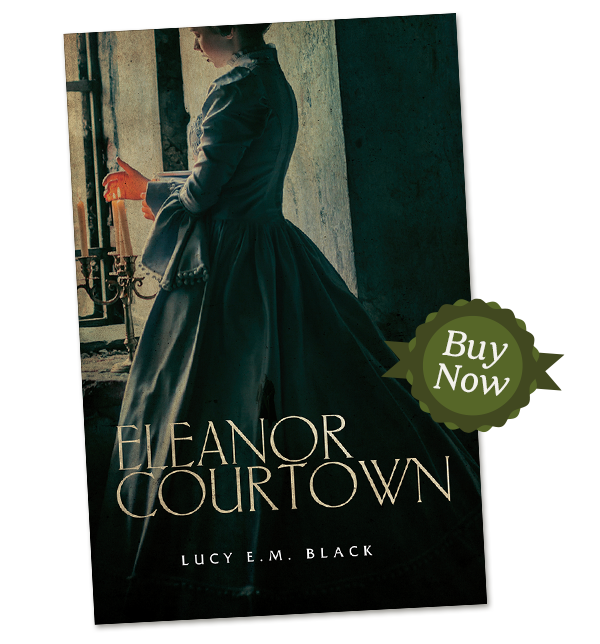 IS ELEANOR COURTOWN YOUR BOOK CLUB’S NEXT READ? DOWNLOAD A LIST OF GREAT DISCUSSION QUESTIONS FOR YOUR GROUP. Follow Lucy E. M. Black on Facebook for news, updates and more! Suffering has come upon me and my strength and senses are both dissipating. Waves of nausea and vigorous tremors shake my frame. I am troubled by all manner of violent contractions. The furnishings spin about the room. I wonder if I shall ever ride again in the park or climb the rocks on my beloved Wexford shore. Mr. Carey has been uncommonly kind and serves me hot broth and thin gruel for nourishment. I cannot make out his character. I wonder that Lily has aligned herself with someone whose status is so inferior to her own. And yet, like a mongrel dog, he bides with her as a ferocious protector and has kept her safe during a time of desperate need. He is no match for her in beauty, fortune, or connection, and yet he has some small amount of charm and wit, and may still, perhaps, prove himself worthy of the match. It is several days since I have been well enough to complete my small routines. For much of the day I remain above stairs, confined to this small chamber and in wretched discomfort. Fever dampens my brow and gown, and the water I pass is brackish. Lily would have Mr. Clement ride for the Doctor, but I am not eager for his ministrations. He is an impatient and proud man, so sure of his own opinions that I am often provoked. He cautioned me against this direction and I do not wish him satisfied in his low opinion of my judgment. The poisoning is when my course became clear. I shall set down these remembrances so that you understand the treachery which transpired. My sweet daughter is asleep beside me on the grassy verge as I recollect these events. My adventures having led me to this place, I intend to record, for her benefit, my entire story. The tale began in Ireland and has ended here in Orange Hill, Canada. In June of 1870 I left my home in Wexford to join my beloved cousin, Lilian Courtown-McDonough. She and her new husband, Rowland McDonough, had earlier set sail with their trunks packed and full of dreams. Rowland, having served with distinction as a member of the Royal Irish Rifles in India, had been offered a land grant in the Dominion of Canada. Lily convinced him that they would do well in new country and that they should lay claim to the land. Rowland was unwilling, but I suspect that Lily used her charms to persuade him, for as the youngest of the McDonough sons, his portion of the estate would not have afforded them a generous income. In truth, Ireland had little to offer, with so many good families struggling in reduced circumstances.